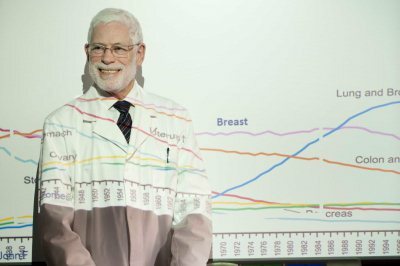 Professor John Forbes believes a cure for breast cancer is not only possible, it is inevitable. The work of Professor John Forbes and his research colleagues has saved the lives of countless women over the past three decades. But the internationally renowned researcher is not ready to hang up his trademark white lab coat and rest on his laurels just yet. A world without breast cancer is Forbes' aim and as a founder and Director of Research for the Australian New Zealand Breast Cancer Trials Group (ANZ BCTG), he believes that this objective is achievable. "Unquestionably, we are winning the war, " the University of Newcastle Professor of Surgical Oncology says. The statistical evidence shows that. "It is simply a matter of having good people, reliable information, paying attention to the quality of the science, interpreting carefully and being receptive to new ideas." Forbes is a decorated oncologist and academic who has been named one of the top 10 researchers in the world in all fields (Thomson Scientific, 2007), holds executive positions on breast cancer committees nationally and internationally and has overseen more than 750 publications from the ANZ BCTG. Breast cancer is still the most common cancer among Australian women but mortality rates have dropped by approximately 20 per cent over the past 20 years. The work of the ANZ BCTG, and the group's international collaborators, has been instrumental in that result. Now, Forbes believes new directions in research involving gene analysis could lead to even greater outcomes and completely change the accepted approach to cancer treatment. "Over the past 30 years, we have been progressively refining the process of identifying types of cancers and specific treatments, " he says. "Thirty years ago everyone received the same drug. Now, we can classify breast cancer into at least six different types and we have a range of drugs we can use, alone or in combination, to treat them. "Increasingly we will be able to sample a tumour, do a whole genome analysis, find the abnormalities and deliver a specific therapy." The ANZ BCTG is part of a large international trial starting this year that will for the first time test neoadjuvant (or pre-surgical) drug therapies on women with newly diagnosed breast tumours that demonstrate particular gene abnormalities. Neoadjuvant drug treatment has in the past been used infrequently, and largely for the purpose of shrinking a particularly large tumour before surgery, but Forbes believes it also has the benefit of allowing doctors to ascertain whether a prescribed treatment is working before they remove a lump. "Today, there are many women who will not know that their drug treatment has failed until they get a relapse," he says. "The paradigm, which hasn't changed in 30 years, is to diagnose breast cancer, remove the lump, then treat the patient with drugs. However, if we start with the drug treatment, there is an opportunity to learn whether or not that treatment is working before the lump is removed." Forbes says the neoadjuvant approach will also enhance the process of discovery, allowing scientists to observe how tumours respond to different drugs, which will lead to better targeted treatments. Forbes was a key instigator in the establishment of the clinical trials group in Melbourne in 1978. At the time, he had recently returned from the UK where he had been working with pioneering breast cancer researcher Michael Baum, the creator of Britain's first clinical trials group. Forbes recognised the need in Australia for a similar large-scale, internationally collaborative approach to testing the effects of drug treatments. The ANZ BCTG was involved in early global breast cancer trials that established the benefits of chemotherapy and hormone treatments, in particular the drug tamoxifen, in post-operative care. It was breakthrough research that Forbes credits with saving "many thousands, if not millions, of lives" of breast cancer sufferers around the world. When Forbes moved to Newcastle in 1987 to take up a Chair in Surgical Oncology, the first academic post of its kind in Australia, the ANZ BCTG operations office shifted with him. More than 50 people now work from the group's operations base at the Mater Calvary Hospital, not far from the University's Callaghan campus. It also has an administrative office in Darby Street, Newcastle. However, the group's network spans approximately 500 researchers and support staff across Australia and collaborations with research groups in 15 countries. More than 15,000 Australian women have participated in trials that the ANZ BCTG has led or participated in, including many from Newcastle. Forbes and his team have contributed substantially over the past decade to major international trials that have established the benefits of drugs known as aromatase inhibitors (primarily Arimidex®) in reducing the risk of relapse in postmenopausal women with certain types of hormone-sensitive cancers. Forbes chaired the global IBIS-I (International Breast Cancer Intervention Study) trial, which showed that tamoxifen could prevent cancer in women at high risk of getting the disease, and is co-chairing the follow-up IBIS-II trial, which is investigating whether the drug anastrozole can have the same preventative effect. But it is the success of his team, rather than individual accolades, in which he takes the greatest pride. "Today, we have in Newcastle one of the premier breast cancer research groups in the world," he says. "This is very good for women, it is very good for Australia and I personally value the impact it has had on my career. "The support of the University has been vital, because there is a big management side to a research program so you need people who are behind you, supporting you, constantly informing you of the opportunities. "This University does that. It is supportive of its researchers, from the top down, and that has been an important part of our growth." Professor Forbes is a member of the Centre for Bioinformatics, Biomarker Discovery and Information-Based Medicine. He researches in collaboration with the Hunter Medical Research Institute's (HMRI) Cancer Program. HMRI is a partnership between the University, the Hunter New England Local Health District and the community.